It's been 20 years since a family from Brazil showed the world how to fight. The Gracies organized a combat tournament in the old McNichols Sports Arena in Denver, invited seven fighters from various disciplines -- a boxer, a sumo wrestler, a kung fu fighter, and so on -- to compete against the smallest guy they could find in their family photo, and put the whole spectacle on pay-per-view television under the title the Ultimate Fighting Championship. The fighting style that Royce Gracie used to defeat three bigger, stronger men and win that one-night single-elimination tourney -- plus two more UFC events over the next year -- was Brazilian jiu-jitsu, a variant of a Japanese martial art that had found its way to South America a century ago. Royce and the other offspring of Helio Gracie, collectively the most prominent practitioners of the art, called it Gracie jiu-jitsu. And today, even as the UFC has moved on to feature fighters well versed in all combat styles, from ground fighting to standing fisticuffs, the Gracies continue to preach the gospel of jiu-jitsu. On Sunday, the first family of Brazilian jiu-jitsu will present its second annual Metamoris Pro Jiu-Jitsu Invitational at Pauley Pavilion in Los Angeles (7 p.m. ET, PPV stream at metamoris.com, $19.95). The six-bout card features an arm twister's row of black belts, from Andre Galvao to Braulio Estima to Kron Gracie, and also some names recognizable to mixed martial arts fans, such as UFC heavyweight Brendan Schaub and Shinya Aoki, a former champion in the Dream, Shooto and One FC promotions. 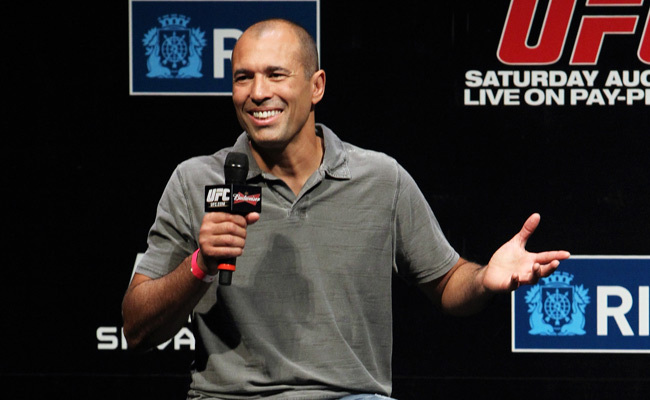 Royce Gracie, whose nephew Relek founded Metamoris, sat down with SI.com to talk about the event as well as what he's up to. SI.com: What seems to set Metamoris apart from other prominent jiu-jitsu tournaments is that there are no points awarded to score the matches in this event. Why is that? Royce Gracie: Martial arts were created as a means of defending yourself. They were not created to score points. So what my nephew did was he took the points out and also made the fights 20 minutes long. It's a mix of endurance and skill. You have to know what you're doing and you have to pace yourself, but to win you have to attack. The best man will win. SI.com: What if no one gets a submission in the allotted 20 minutes? Gracie: This year there are three referees who will decide who won. Not by points, but by who was the best fighter. And it's possible, also, that the fight will be a draw. SI.com: Another of your nephews, Kron, is in the main event, against Aoki. What is it like for you to watch him compete, as opposed to being in there yourself? Do you get more nervous? Gracie: [Laughs.] Yes, I get more nervous when I'm in the corner than when I'm in the ring. My nephew knows what he is doing, but when I'm watching I can't react for him. I can help him train, but on the day he's the one who's going to walk in and take care of business. SI.com: Speaking of which, do you have any unfinished business in fighting? A couple of years ago, when the UFC returned to Brazil after a long absence, there was talk that you might make a comeback. You even said you had one fight left in you, that you wanted a rematch with Matt Hughes. But now Hughes is retired. Are you officially finished, too? At age 46, do you feel comfortable with that? Gracie: Man, been there, done that. I fought in the first UFC, three fights in one night. Second UFC, four fights in one night. I fought the second-longest fight in history. My father had the longest fight in history, three hours and 40 minutes [against Valdemar Santana in 1955]. I fought for an hour and 45 [vs. Kazushi Sakuraba in 2000]. I fought against Akebono, 6-foot-8, 490 pounds. Yeah, I paid my dues. I did my job. I sleep fine at night. SI.com: With no fighting in your life anymore, how do you satisfy your competitive nature? Gracie: I just got back from an MMA tournament in Dubai. And the night I got there, I heard that earlier in the day the promoters took some fighters up in a plane for skydiving. But when they got up in the air, most of the guys were, like, "Uh-uh." No one wanted to jump. I thought, man, I would have been the first one off the plane. Get out of my way. I'm a Gracie. We take every day as a competition, a challenge. SI.com: I suppose in your family you get that way from an early age. Are your own young kids always pulling out a checkerboard and saying, "Let's go, Dad"? Gracie: They're always challenging me. And that's good. They keep me on my toes, man. Keeps the sword sharp and clean. SI.com: You don't seem like a guy who'd let someone beat him. Do you go hard at the kids? Gracie: [Laughs.] Well, with the kids, we want to build them up to win. So every time they challenge me, I push them and push them, and at the last minute, they take it. SI.com: What do you think of the MMA that your kids are growing up watching? The fighters of today are well versed in a variety of disciplines, from standup to the ground. The thinking is you can't survive as simply a jiu-jitsu guy anymore. Do you agree? Gracie: Fighters have to adapt. Look at Lyoto Machida, for instance, or Chuck Liddell. They come from a karate background, but they had to learn wrestling to avoid being taken down. If they did wind up on the mat, they had to know jiu-jitsu, just to know what's coming at them. I learned my boxing and kickboxing not because I was planning to knock somebody out. I just needed to know how standup fighters moved, how they would set me up with a kick or punch. So, yes, fighters have evolved, but they all have one main style that they call home, where they feel most comfortable. SI.com: Nowadays, though, a lot of gyms don't teach one particular discipline, like jiu-jitsu or karate. They teach mixed martial arts. Do you think something gets lost when young people learn this way rather than focusing on a single tradition that's been passed down through the generations? Gracie: You don't say, "Hey, I'm going to go get some Starbucks." No, you're going to get some coffee at Starbucks. "Hey, I'm going to make a Xerox." No, you're making a copy on a Xerox machine. So kids want to learn mixed martial arts? Mixed martial arts is what you do inside the cage, inside the ring. What they should be looking to learn is a martial art. You learn a style. You learn wrestling. You learn Gracie jiu-jitsu. You learn boxing. You learn judo. You don't learn mixed martial arts. You learn a style or maybe more than one style, and then you mix them. But you don't teach a mix. People come up to me all the time and ask, "Do you teach UFC style?" [Laughs.] UFC is a brand. It's not a martial art.